Learn more about locating your business in Greenville. ONE is at the center of a market with over 1 Million people in the MSA. With over 2.5 Million unique visitors to downtown each year, the city pulls from across the region and the world. The perfect place for flagship retail is at ONE, in THE retail destination for downtown Greenville. 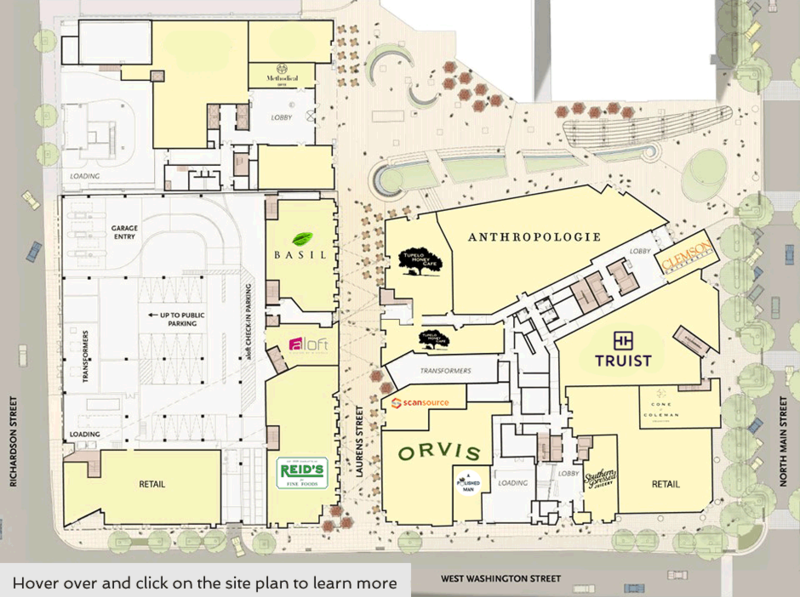 The site plan shown above details our remaining spaces that can be divided. Each space features floor to ceiling retail glass, high ceilings and countless options for configuring your open floor plan. If your store or restaurant fits with our first class tenants, we will find you the perfect home. The building construction is built to LEED Gold standards, with retailers having the opportunity to follow a few guidelines to certify their space as well. 1,200 office users are in the towers above each day with hundreds of thousands of additional feet of office space within walking distance. With free on street parking and over 1,200 garage spaces with free nights and weekends on site, accessibility is easy. Only two turns from Atlanta or Charlotte, ONE is the most convenient meeting place in downtown Greenville. Remaining retail ranges from small niche spaces to a gorgeous, high-ceiling, two story space. Bring your first-rate restaurant and enjoy outdoor dining on the plaza or along Laurens Street or align your retail store with Anthropologie's chic inventory for additional synergies. North Main area and back.